Hi Everyone, i havent been on here for a while. I have come to a stumbling block. I can not find the death date of my great grandfather. His name was Samuel Reid. His wife was Sarah Jane Thompson. They had many children including my grandmother Mary Jane Mealey (nee Reid ) and her twin sister Elizabeth Macauley (nee Reid). I have his birth date as about 1876. My aunt who is 92 says he died at the age of 72. My mother says he died before she was born in 1943. I know his last child was born in 1915. So somewhere between 1915 and 1943 which is a long time he died. Any help or suggestions would be most welcome. There are soooooo many Samuel Reid's. You can search for Samuel Reid deaths in Belfast on GRONI. There’s a few that are near the right age but many are not. (His marriage certificate gave his age as 19, so born c 1873). Closest I could see was 15.9.1934 aged 60. There’s also one on 2.2.1947 aged 74. That’s the nearest to the information your aunt gave. You might feel it’s worth paying to view those two. It’ll cost you £2.50 per cert. As you may know, the Reid family had a long standing connection with 65 Beersbridge Road going back to Robert Reid the father. 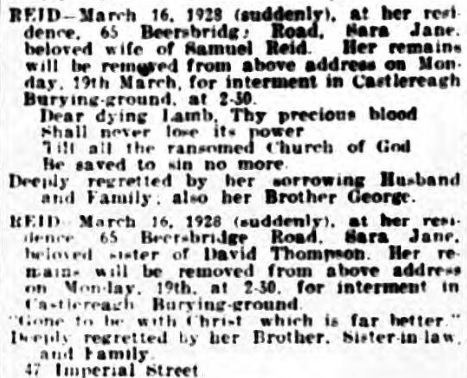 A death notice in the Belfast Telegraph of 17 March 1928 said 'REID - March 16, 1928 (suddenly), at her residence, 65 Beersbridge Road, Sara Jane, beloved wife of Samuel Reid. Her remains will be removed from above address on Monday, 19th March, for interment in Castlereagh Burying-ground ... beloved sister of David Thompson ...'. An 'in memoriam' notice in the Belfast Telegraph of 16 September 1935 said 'REID - In fond and loving memory of our dear Father, who fell asleep 16th September 1934; also our dear Mother, who departed this life 16th March, 1928 ... Ever remembered by their sorrowing Family, Sons-in-law, Daughters-in-law, and Grand-children. 65 Beersbridge Road ...'. So I imagine the GRONI death of 15 September 1934 refers. How does one get access to belfast obiturary? further directories all remain constant that he was a labourer expanded in the census to be a corporation labourer. Baptisms, 1885-1901; marriages, 1888¬ 1900; membership register and quarterly class roll, 1911-22; congregational register, c.1920. Printed history published c.1968 Baptisms and marriages, 1864-.